If you have asked (or yelled) this question at your television or made that somewhat rhetorical inquiry on Twitter, let me save you some time: Mike Matheny’s new book, The Matheny Manifesto, will not give you the answers you’re looking for. The book is not about Mike’s bullpen philosophy nor does it give an insight to how he develops the batting order. It does discuss Mike’s beliefs as to how youth sports (specifically baseball) should operate. So if you are a parent, teacher, coach or all of the above, it might resonate a bit more. As a quick background, shortly after his retirement from playing, Mike Matheny was asked to coach a youth baseball team. He agreed but decided that if he was going to be the coach, it was going to be on his terms. He wrote a letter outlining the expectations he had for parents; the expectations for the young athletes who were to be on his team and what the parents could expect from the coaches. That letter, later posted on the Internet, became known as “The Matheny Manifesto” as it went viral. Hence, the title of the book. Thanks to the heads-up from a friend, I was able to take advantage of the opportunity to attend “A Very Special Evening with Mike Matheny” at Lindenwood University last Monday, February 2. Attendees received a signed copy of The Matheny Manifesto upon arrival. The program consisted of a chat facilitated by Greg Amsinger of MLB Network, followed by a Q & A with the audience. Again, the thrust of the conversation was geared toward topics covered in the book (no MLB in-game strategy talk) and how Mike put this “manifesto” into action. That said, there were some anecdotes from his current position as manager of the St. Louis Cardinals. Some of the stories he shared are in the book, but I found that some of the stories presented Monday evening were slightly different than how they appeared in print. Their point, however, was the same. One story Mike shared occurred early on. One of the first to read the letter later known as “The Matheny Manifesto” was John Mabry. John’s son was going to be on Matheny’s youth team and the two former MLBers had played together, so Mike thought he’d get some input from John. According to Mike, John didn’t think the letter was such a good idea, yet he didn’t let Mabry’s skepticism deter him. Mike gathered up the parents (including John Mabry) for an informational meeting at the Matheny home and, in front of the fireplace, read the letter. Most parents said they were not expecting all that. When asked if parents bought in to his approach, Matheny responded, “Parents did buy in. Some folks did leave.” He went on to say they tried to help those who chose to leave find a team or league that would work for them. Mike said that apparently his philosophy has resonated with others. He has heard from many in baseball, including other MLB players, about it. Greg Amsinger admitted, “After reading your book, I’m second-guessing my parenting.” The expectations are set high for parents and athletes. Many of the ideals found in the Manifesto came from Matheny’s parents and the experiences Mike himself had as a youth league baseball player who managed to make it not only to college, but to professional baseball and MLB. As Matheny tells it, his parents sat in the stands for the game and cheered the rest of the team on. On the way home, Mike was still less than pleased with his benched status. His parents then told him, “You need to change his (the coach’s) mind.” Mike took that to mean he needed to work harder to win back his starting job. So he did. In the youth league, one of the rules was no arguing with or “showing up” of the umpires. Obviously, in Major League Baseball, there are times that the team or player needs a manager to argue a bit. One of the more amusing tales from his time as manager of the Cardinals had to do with getting thrown out of a game. 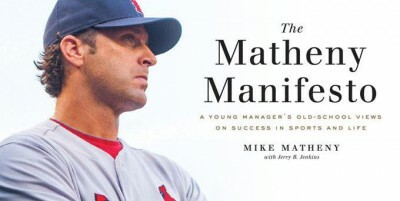 Given the theme of the book, Matheny losing his teammate and very close friend Darryl Kile and his reputation for very good leadership abilities, Matheny was asked about his approach to the team and this upcoming spring training and season given the huge loss of Oscar Taveras. Mike replied that he first let his players know he had been there. Darryl Kile was the first person Matheny was close to who died. He had not lost even a grandparent. When Kile died, the team was shaken. Matheny experienced how guys had to put down their bravado and admit weakness, which is not something professional athletes do easily. As far as what is in store for spring training, Matheny said they are putting some things together to focus on urgency — the urgency of life. Matheny was asked which players had the biggest influence on him. His answer was Mark McGwire. Mike shared that Mark McGwire demonstrated what “being a good teammate” was. “To see a superstar player interact with fans and teammates the way he did was special.” Matheny’s fondness of McGwire led to talks about lies and cheating and forgiveness; reputation; and how hard it is to build back a reputation once it’s tarnished. Albert Pujols also made Matheny’s list as a great teammate, even though he wasn’t necessarily known for that. Albert was the most focused and determined player Matheny has been around. Mike believes the media misconstrued that because Albert would not let anything get in the way of his pursuit of excellence. That said, Matheny was able to see another side of Albert. According to Mike, Albert showed up to a practice of Matheny’s 10-12 year olds and asked Mike if he could work with the group and teach them hitting. Of course, Matheny agreed. After that practice, Albert asked if he could come back and work with Mike’s team on fielding. That, he said, was Albert. Matheny also was asked who was the better catcher, himself or Yadier Molina? Matheny answered this in no uncertain terms. “We are watching the greatest catcher in history.” Mike then reminded the audience that he grew up in Ohio, watching Johnny Bench play. Quite the endorsement for Yadi! Matheny also noted in another answer that Yadi commands so much respect that Mike goes through Yadi to position players on the field. (Matheny also sang the praises of Jose Oquendo as a coach). He also spoke about keeping baseball fun for kids and what it takes to make it to the next level (college) and beyond. While much has been made of Matheny’s Christianity, he really only made mention of it specifically for about 5-10 minutes of the two-hour conversation. That said, it’s clear that those Christian principles are the basis for his philosophy. At the end of the evening, we weren’t any closer to figuring out Matheny’s in-game strategies, but it was easy to see where the “great leadership skills” line comes from and why Mike’s players admire and respect him. This entry was posted in General Cardinals and tagged Albert Pujols, John Mabry, Mark McGwire, Mike Matheny, The Matheny Manifesto by Stacy Brixey. Bookmark the permalink.